Happy Sunday, everyone! I'm posting this a day early because I know most of us do our holiday themed manicures a day in advance and because I'm going to be gone for all of tomorrow. It's my first day off from work since I graduated and I am INCREDIBLY excited to sit by the pool and relax. Maybe have a Malibu Bay Breeze... or three. I haven't done a Zoya-centric post in a while (GASP! ), so I figured now would be an excellent occasion to do so. For those of you who follow me on Pinterest, you got a sneak preview yesterday afternoon! I wanted to do something fun and funky, but wanted to avoid painting the American flag. I love Old Glory, but it's so overused for Memorial/Independence Day. So I decided to stick with just the red white, and blue, but keep it playful at the same time. And what's more playful than polka dots? I picked out Zoya Snow White, Zoya Sarah (my all-time fave Zoya), and Zoya Ibiza because a: they're gorgeous and b: I thought they best matched the colors of the flag. Using a double-ended dotting tool with the biggest and smallest points, I scattered dots all around my nails. I started with the big dots first, dotting Ibiza and then Sarah. Seeing the white space that was left, I flipped to the tiny end and dotted Ibiza and then Sarah to fill in the holes. I repeated the small dots to fill in the spaces, varying the amount of polish on the end to make it look like there were more than two sized dots on the nail. I'm really happy with how this came out. I think that it's definitely what I was looking for in that it's really playful and fitting with Memorial Day, but I could also get away with wearing it another few days because it doesn't have a distinctive theme. I love when nail art is versatile! 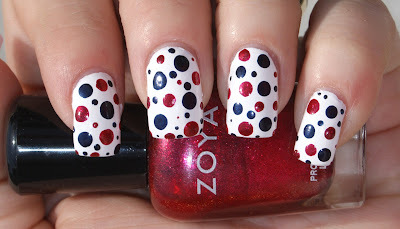 Are you thinking of trying a dotticure for your Memorial Day plans? Enjoy the BBQ's and hopefully, nice weather! Hey just found your blog and am loving your holos you made! So pretty. I also love these dots! Very cute! :) Have a great day relaxing! I love your take on the Memorial Day theme! I agree that the flag patterns can get a bit repetitive this time of year.